Being a long time subscriber to Previews monthly comic magazine I’ve collected a lot of back issues in my basement and they really started to pile up. Another problem I had was my comic storage boxes all looked the same and trying to find which one had my Action Comics collection or my Spider-man comics was getting more difficult. At one point I just wrote what was in the box but it’s not much fun and they get worn and torn after a few years. One solution came to mind which helped me solve both these issues and it was to just PVA glue (w two parts water) my magazines to the boxes. Thanks to events like Spider-verse I’ve the recent months have had an abundance of themed covers which match really well. Considering how each Previews world magazine is cover to cover full of comic covers it leaves you with a lot of artwork which you can use without cutting up your actual comics. It took about one magazine for each box with a load of pages left to start a second box. It’s a fun way to spend an evening and keeps your comics safer / easier to find so well worth it if you have a loads of old Previews stacking up too. 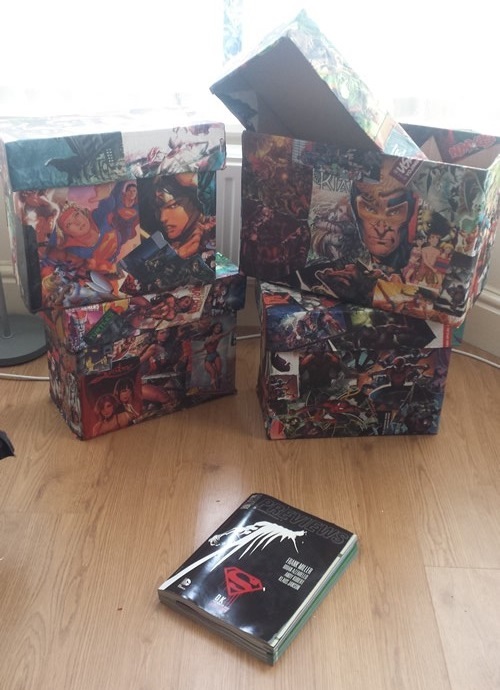 The outcome is some totally unique pimped out comic storage boxes for minimal cost and helping recycle old but still very awesome comic mags.